Before we take a look at tonight's program, we have to agree that The Champion of Champions lived up to expectations. The match-up of Moonist and Heza Dasha Fire was a great one and the best horse of the night was Heza Dasha Fire. Moonist can sometimes tend to break slow but this time he broke clean and fast and looked to be in prime position to take it but Heza Dasha Fire kicked on with tremendous ease. Great race. I'm glad both of them got clean breaks and were able to show their best efforts. 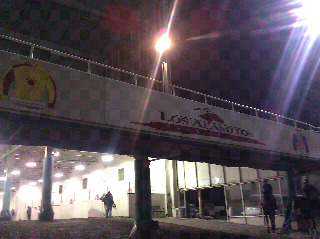 Tonight's Los Two Alamitos Futurity has Ima Fearless Hero as the 2-1 morning line favorite from post position ten. Ima Fearless Hero is the half-brother to Heza Dasha Fire and they have the same owner, trainer, jockey, and have the same outside post positions. Will the movie repeat itself? #4 Highly Cynical was against too tough of a field last time out. He's run well over the nighttime oval and he's got enough speed to work out a good trip stalking the pace. #6 Full Fare ran a very good race two starts ago and will be tough to beat with a repeat effort. #2 Flashy Big didn't get off to the best of starts in the trials and now shows up for a claiming tag for the first time in his career. I have always been pretty high on this runner and I think he should be tough to handle with a clean trip. #4 Roll Tide ran a better-than-looked effort in the trials. He ran on and made up some ground from the rail post after a tough start. He's drawn next to the slow-breaking Thermonuclear Energy and hopefully he can get a jump on the field and post an upset. #3 Time For Action has shown improvement in her last two starts and it won't take much more than that to win this race. #3 Lady Delaney was a beaten favorite last time out at this level but I think she's in a great spot to earn her sixth career victory. #5 Vizcaya has had a couple of troubled trips in her last two starts but if you ignore them and go three races back when this jockey was aboard then she looks good in this spot. #7 Sheza Flight Risk has been a consistent runner all year long. Tough to not like her consistency at similar levels and I like her outside post. #4 Docs Best Card has qualified to all the major futurities this year and has been unlucky in a few of the finals. He looked great on trial night and was finishing strongly. Let's just hope for a clean break. #10 Ima Fearless Hero has five wins from seven starts and has never been off the board. Who knows how good he might be. His trial win was his best race yet. #5 Dynasty Energy can be a big factor if he breaks sharply and avoids drifting paths. He's always shown talent and the distance shouldn't be a problem. #2 Walk Thru Crystal began her career a perfect 5-for-5 before losing her next two outings. She rebounded with a good victory in the trials and while i don't think she prefers this distance, I think she can hit the superfecta.